Compatible Dell Toner Cartridge, Black, 3,000 page yield. Replaces Dell part number: 310-6640. 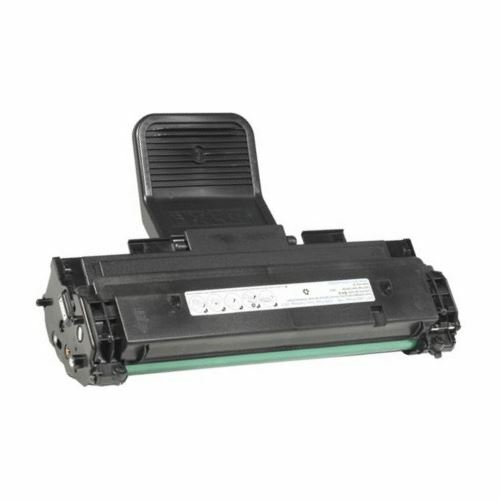 Laser Toner Cartridge compatible with Dell 1100, 1110. 30 out of 30 (100.00%) customers would recommend this product to a friend. I love that I can re-order with no hassle. The products always meet or exceed my satisfaction and the price is right. I think your web site is one of the easist I have ever used. Please keep up the good work. You certainly make my life easier. So far, the product is working great and is a much better price! I love being able to get these printer cartridges for less than our local office supply. Page yields are good and I will continue to buy. Cartridge shipped fast. Although not the brand name, worked just as well.No issues with printing. Fast delivery, excellent quality, fit correctly and worked fine. These are great cartridges and last for a long time...Best value for the dollar! This company has excellent customer service. Very pleased with the whole service. My cartridges arrived on time, well packed, and I have been printing with these cartridges. There was a big difference in price from what I was quoted at a big store. Great products at great prices with fast delivery! The toner rates well above the original. The service by the company is better than any other company, in all fields. There is absolutely no reason to shop elsewhere. I am very pleased with this toner which I bought for my printer after being low for several months. Now my printer prints fine with excellent print quality and I am very happy about the price. The toner prints comparable to the Dell toner. I do recommend this product. The toner cartridge works great but quality is hit or miss meaning the first time I replaced the toner it worked great but this last time it took less than a year and lines are showing up on the paper. This does the job at about a third of the price that I would pay from Dell. Great deal!! The ink was better then Dell ink at $87.00. I have used this company and their products for years, nothing but good products have I received. Overall good value for price. Print qulaity is good. Price reasonable. Fast shipping. This compatible toner is far cheaper than OEM and works good for the type of printer we use. Ink cartridge is easy to order and arrives quickly. Print quality is fine and I will continue to order in the future. Original dell was over bucks. This cartridge was a fraction of the price and works great. Had hard time to find these items. Ink Technologies has them with very good price. I bought this cartridge for my Father's printer after he used up the OEM toner. Great product. I ordered these to try out to see if they would be a good replacement for the more expensive Dell brand. Very happy with these. Great quality. Good page yield. Good value for this product. I was amazed at the prices they offered. I am glad to find a good quality toner at a reasonable price. I went to Staples to buy this and they no longer carried it in store. I found this on a google search and I think Staples did me a favor. Works as good as the OEM and much cheaper. Searched for this toner all over town. If I could find it stores wanted 70 bucks or more. It was almost cheaper to buy a new printer. Came home did a google search found this company and purchased toner at half the cost of the other "guys" and it arrived 3 business days later. Thank You Ink Tech! This product arrived on time and is an excellent accessory for our printer. Product is new as promised. I would (and will) order again from the company. I love the ink for my printer. It lasts forever and the quality is better than the high-priced toner. I wish I had found this company earlier so I wouldn't have spent all that money on a better product. First time I have used this company, it is great. Genuine OEM Dell Toner Cartridge, Black, 2,000 page yield. Dell part number: 310-6640. Laser Toner Cartridge compatible with Dell 1100, 1110. Qualifies for free shipping & earn 95 points! A video covering the New Compatible Dell 310-6640 black toner cartridge, with a replacement demonstration and specifications. The 310-6640 toner cartridge contains black toner, with an estimated yield of 3,000 pages, based on 5% page coverage. This is a step up from the standard replacement cartridge, rated for only 2,000 pages. The cartridge weighs around 5 pounds, and has a collapsible handle that makes for easy installation. When your compatible Dell 310-6640 toner cartridge arrives, carefully take it out of the box and set aside the packing materials, then remove it from the bag as well. Remove the tape strips and the paper protecting the drum, then tilt the cartridge from side to side several times to loosen the toner powder. The two pieces of the handle need to be rotated toward the center and locked into place before installation. Pull the front access panel toward you and rotate it down out of the way. Grab the empty cartridge by its handle and pull it forward to remove it. Slide the replacement Dell 310-6640 cartridge into the opening in the same orientation, pressing backward on the handle until it is completely inserted. You can then close the panel. The 310-6640 toner cartridge is compatible with two different Dell models: the Dell 1100 and the Dell 1110. For a list of Dell 310-6640 compatible printers, see the “Fits Printer Models” tab.